The Chastain Park neighborhood is the area immediately surrounding the 268 acre park. 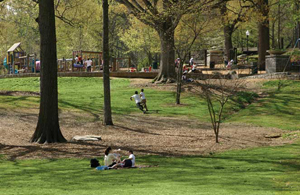 It is the largest and one of the most popular parks in Atlanta, offering a wide array of sports facilities. The Path Foundation raised money and installed a sidewalk that goes around the entire park, which is extensively used by walkers, joggers and runners.